British born composer Lydia Kakabadse “is a phenomenon and a virtual reincarnation of an earlier music master and her music is impressively singular” (Gapplegate Classical Modern Music). 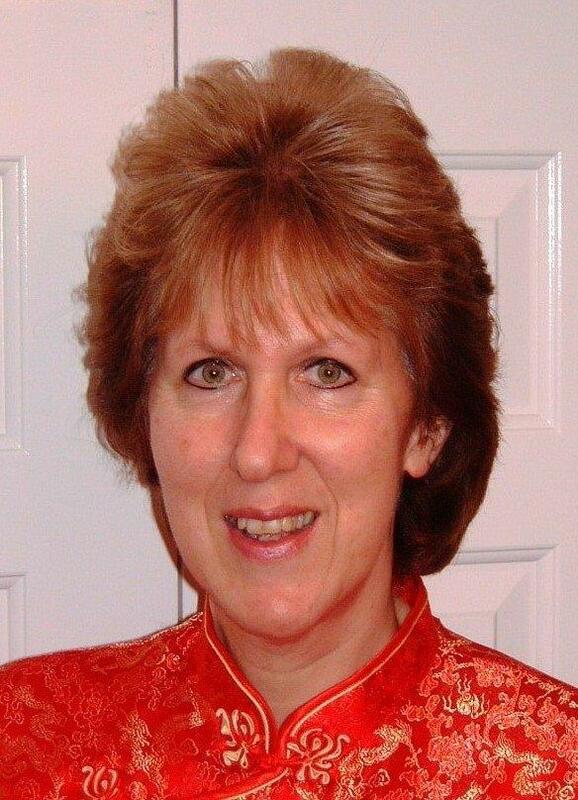 “A very gifted and accessible composer” (Music Web International), Lydia writes mainly choral, vocal and chamber music. Her works, which have been released on CD under the Naxos and Divine Art labels, include string quartets, string duet, songs, musical dramas, cantata, concert Requiem Mass and choral works for male voices, mixed choir (SATB) and children’s choir. Her unique compositional style – “brilliant in respect of writing and musical ideas” (Jazz & Tzaz) – features the double harmonic scale and combines open triads and Gothic features with Middle Eastern traits and rich melody. An avid Latin enthusiast and greatly inspired by Mediaeval music, Lydia has written original texts in Latin for her vocal works and also adapted sacred Latin texts. Recent commissioned works include I Remember (a choral work for children’s choir) commissioned by Forest School (Greater Manchester) for the Bellevue Education Northern Music Festival 2016 and Odyssey (a choral work for mixed choir (SATB) with harp accompaniment) commissioned by the Hellenic Institute at Royal Holloway University of London in celebration of its 25th anniversary in 2018. A composer from the age of 13 and an accomplished double bass player and pianist whilst still at school, Lydia read music (B.Mus Hons) at Royal Holloway University of London. All her string quartets are scored for violin, viola, cello and double bass, a timbral combination that works well, with the double bass adding a great richness and abundance of colour to the quartet’s sonority. Lydia’s works have been broadcast worldwide and her string quartet Russian Tableaux was broadcast by BBC Radio 3 to mark International Women’s Day in March 2015 & 2017. This work was also played at the 3rd Hildegard Festival of Women in the Arts (March 2015) in California. Lydia’s compositions have been performed by acclaimed chamber ensembles and choirs, including the “Rossetti Ensemble” and the choirs of Gonville & Caius College Cambridge, Clare College Cambridge and Royal Holloway. In recent years, Lydia’s works have been performed at numerous UK venues, including St. John’s Smith Square London, Grosvenor House London, Ely Cathedral, Norwich Cathedral, Royal Northern College of Music and various University College chapels. Certain of Lydia’s works are published by Noteworthy Sheet Music LLC. She also holds a Master’s degree in Law (LL.M distinction) and, in the past, worked as a solicitor to fund her many music projects. Lydia and her husband have been living in Santon Downham since July 2006. 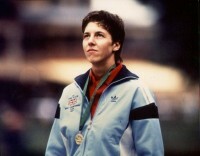 Slalom Canoe World Champion: 1983 and 1987. My married name is Elizabeth Radford, but I used to paddle kayak and my maiden name was Sharman. I was born in 1957 in Bolton Manchester, which is a far cry from Suffolk! At what age did you become interested in sport? I had always been very athletic and joined in most games and competitions. When my parents moved to East Anglia in the early 70’s I was about 15 or 16 then, I noticed that there was a local canoeing club in Bury St Edmunds and went along. I got interested quite seriously in kayaking and it went from there. I met my future husband (George) He was quite substantial in stimulating my career in that sport. Were you living at Bury St Edmunds at the time? No, we were living near Stowmarket, in a village called Tostock. My mother was District Midwife for the area. Did you start training when you were 15? Oh yes! The rise was meteoric actually. We discovered that I had a flair for kayaking. and we set out a cunning plan. We decided that we would go at it through the divisional system that was five or six divisions from grade six up to premier. We achieved this in one season. It meant a great deal of driving. I think we did about twenty thousand miles that year, if I remember rightly. (much more I am being told from the other corner of the room!) Going to different slaloms every weekend to get promoted and eventually we got to the top division and got selected to the British team. From there I went to Canada in 1978 and got silver in the Pre World Championships. I returned the following year, I was 18 at the time, to get the Silver Medal in the World Championships missing the Gold by .46 of a second! If I had stuck my tongue over the line I might have got the gold, but I was very inexperienced in those days at top- level competition. It took about ten years before I was really top flight and consistent enough to win gold medals at World Championship standard. When I first went along to Bury St. Edmund’s Canoeing Club all those years ago, we used to do regular training on the Little Ouse at Santon Downham, and that was one of the deciding factors in us moving to the village in 1988. We actually saw property for sale, came along and investigated and decided that was for us. It would mean a lot less travelling because I was coming to Santon Downham two, three, four times a week to train on the river which had a very minimal flow compared to what I really needed, but it was better than driving to North Wales or Scotland. We moved here and from then on it was a lot easier to do the training and I was a little closer to North Wales as well, being a little further down the A14 corridor. Basil Branch at Kennel Bungalows was a big help. He used to see me parking on the road outside his house and putting strings across the river at the side of his house. The river runs down by the side of his property and Basil being inquisitive said: ” what are you doing there then?” He ended up holding the stopwatch for me, and helping me a tremendous amount with my training. I won the Championship twice before I moved to Santon Downham. I won the World championships in Italy in 1983 and in France in 1987. I decided in1987 that the only thing that had eluded me was an Olympic medal or the chance of being at the Olympic games. I wanted to, I suppose jump on the bandwagon. 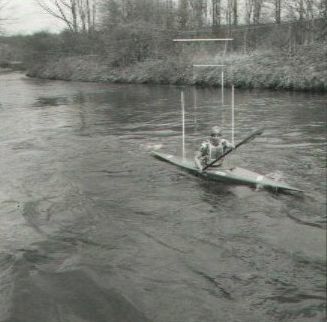 With regard to the Games I hadn’t had the opportunity to go in my own sport, I though: Well I could step sideways in various disciplines of canoeing and go into sprint canoeing. 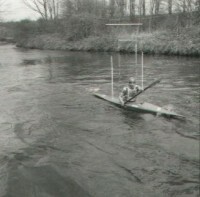 I decided that I wanted to go to the Olympic games basically, so about twelve months before the games in 1988 I thought: Right I’ve done every thing there is to do in canoe slalom I’ll hop sideways into canoe sprint which is a flat water discipline and see if I get a chance of going to the Games. We started training with a bloke in the area. Actually he was paralysed with polio and couldn’t walk and was on crutches. He was called Jonathan Gloyne-Walters and lived at East Burgholt. Under his tuition I learned to sprint paddle rather quickly. I went to the trials for the Olympic games at Holme Pierrepont and got selected to paddle in the k 2. in Seoul. I got my trip to the Olympic games. There was absolutely no chance of winning a medal with only an 18 month preparation; remember I had been going for 20 years at canoe slalom and had I’d had the opportunity at canoe slalom, I might have had a pretty strong chance! The original recording containing further information and description of the procedure in judging competitions and equipment used can be heard on the audio recording which will be kept in the archives at Bury Records Office. Mr Rex Whitta was head Ranger at Thetford Forest before he retired. He played a major roll in many research projects, and worked extensively with universities, the R.S.P.B and Wild Life Trusts. He came to live in Brandon at a very early age, attended Brandon school and enjoyed his time there. When he left school at fourteen, he went to work at Calders, the timber merchant on the Weeting Road. Later he got the job with the American forces at the Elveden Camp. From there he joined the army when he was eighteen in 1945. After leaving the army in 1948 he started work with the Forestry Commission at the old central Brandon depot, where they used to convert the trees into pit props. Rex was very glad that Betty, his wife, gave him her full support, in spite of the fact that it was a seven days a week job, long and uncertain hours and financial sacrifices. They both agreed that it was better for Rex to do something he really enjoyed; Betty decided to take a part time job. Rex was often out all night or early in the morning, often late for meals. When Rex first started, there were two areas to supervise. The northern part was his territory. The job entailed census work, trying to count all the deer in the forest. He had to inspect the new planting areas for damage, and assess the number of deer that would have to be culled to control the numbers in order to maintain the quality of the stock, to prevent disease, and protect the crops. Rex says: “We had 4 species of deer in the forest, the big magnificent Red Deer,(probably some of the best wild deer there are in the country) we had Fallow Deer, to the south of the forest towards Bury St. Edmunds, the Roe Deer which were by far the largest number, on both sides of the forest and the Muntjac that started to creep in”. Rex was one of the key figures in the monitoring programmes to determine the movement of the deer, specially the Roe. In order to help with control work involved a catch up project that was carried out by Rex, the Forestry Research Team from Alice Holt and volunteers. The Santon Beat was selected, the area near Santon Downham village. The deer were weighed, blood samples taken and collars fitted. Some were radio collars others were fitted with different coloured collars. After several days, Rex and his team would try to locate these animals. The furthest a deer had roamed from the catch up site was four miles. Rex recognised the importance of involving the public from the outset, and this was one of the key element to insure that volunteers were recruited to make all the projects successful. As far as Rex is aware, the Red deer have always been in this area (escapees from various hunts that existed here) The Munjac Deer are thought to have bred from escapees from Woburn Abbey. During the World Wars the fences became dilapidated, and the deer escaped and spread. The Roe Deer thought to have been imported by Col. Macanzie’s brother when he occupied Downham Hall. He imported 6 pairs from Wittenberg in Germany and released them in the wood known as Risbeth Wood up behind the old leper house at Thetford. The fallow deer escaped from various southern estates. The ideal conditions in the forest caused a rapid population increase. This necessitated a severe culling programme. Rex was responsible for this. Later, the number of staff was increased to six. In about 1959, a club called St.Hubert’s became involved in the culling and control of the deer herds. Their membership and methods are very carefully monitored, maintaining high standards. They were responsible for an area of about 7or 8 thousand acres on the northern side of the forest. Prior to the employment of rangers, there were about 18 warreners. Their sole job was to control the rabbits and hares. They were gradually retired and replaced by rangers who took on their jobs as well. The damage done by deer to the young trees is quite different to that done by rabbits and hares. At first, deer were often blamed for damage done by rabbits and hares until Rex was able to point out the difference. Rabbits and hares tend to eat the growing shoot whereas the deer damaged trees by bending and breaking the plant in a jagged manner. Rex says that the other project he was involved with was with the native Red Squirrel, which inhabited the whole of the forest. When he first started, the Greys hadn’t even put in an appearance. A few inhabited the outskirts of the forest in the hard wood area. Later there was concern that the Greys were starting to come into the forest. Unfortunately the Red Squirrel suffered with a viral infection at that time which decimated the population tremendously. This calamity coincided with the increase in the number of Greys, and the Reds never recovered from that time. People say that Red and Grey squirrels fight; but this is only true when there is a shortage of food. The Grey squirrel forages for food and adapts to different conditions quite easily, the Red Squirrel doesn’t. This is a disadvantage against its survival. The Forestry Commission decided to try and conserve the Red Squirrel in Thetford Forest. Rex and his team had to do a survey. Two areas were selected for this. High Lodge and Red Neck Forest that is between Brandon and Thetford. In order to conduct the survey volunteers were asked to come once a year to help with the work. At one time there were as many as 150 people coming early on a Saturday morning. The volunteers were given a breakfast of venison sausages, tea, coffee or any other beverage of their choice. This encouraged them to come back each year! They were split up into groups. Each group was led under the direction of a Ranger, a Forester, or somebody from one of the Wildlife Societies. Each group was allocated four or five compartments. They walked through and looked for squirrel drays, and any damage. They would record all this and any cones that were on the ground were counted and recorded onto data sheets. All the information collected would go to Rex at the Santon Downham Office. The survey used to take about three or four hours. Every thing that was seen in the way of animals, or birds was also recorded. The survey started in about 1975, and continued for fifteen years. The largest number of Red Squirrels counted on a single morning was twenty-one. When Rex retired, some of the volunteers who helped him and the team were from the original groups. During this time the number of the Red squirrels continued to decline. Around the survey area it became necessary to control the growth of the Grey Squirrel population. As time went on, the Nature Conservancy became involved with the project, and it was decided to reserve an area solely for Red Squirrels. This became too much for the Commission to do, so that the Nature Conservancy set up a project whereby they employed a student Mr. John Girton to do all the research work at Southampton University whilst the volunteers and Forestry Commission continued with surveying. Since Rex’s retirement, several students have continued the project. A breeding programme in two pens over an acre in area with a high fence to keep the squirrels safe and all the necessary elements are provided. When the squirrels are able to survive, they are released into the surrounding forest. Bird protection was another of Rex’s tasks. Mr. Ron Hoblin, who was the Forester at the time, was also involved in this project with the RSPB. The Woodlark, Stone Curlews, Goshawks and Nightjars were the main bird under protection. A student was researching the Nightjars and Woodlark. Rex says that the Goshawk just appeared. It is believed to have been released by someone possibly because they wanted it to breed, so that they could milk the nest. Although some of the nests were robbed, the majority of them were protected. The task of protecting the birds was a long and tiring one, needing constant vigilance and a dedicated team of volunteers including members of the RSPB. The alarm system terminated at Rex’s house, so that he could be called out at any time of night or day. The teams were constantly changing with each team doing four to five hours. Betty, Rex’s wife, bore all the upheaval with good humour, and they were all rewarded with the survival of the chicks to adulthood, after about three months of patience and perseverance. Another of the Forestry Conservation projects was the Bat Project started in the 1970’s. Rex says that John Goldsmith was “a big mover in this”. He worked at Norwich Museum and was associated with the Norfolk Nature Society. He suggested that bat boxes could be put up to encourage them to come into the forest. In this way the bats species, diet and their beneficial effects could be studied. Within several years of the project starting, six hundred boxes were made and put up in various locations, Red neck, High Lodge, Brandon Park and the northern side of the River Ouse. Once again recruited volunteers willingly monitored the boxes four times a year, early Spring, Summer, Autumn and late Autumn. Four species of bats were recorded: Common long Eared, Pipistrelle, Natterer’s and the largest was the Noctule bat. Rex says it was quite amazing how the bats used to get into the boxes. There was a tiny quarter of an inch slit underneath the box where they could get in. The board was serrated so that they could grip when they landed on the box and make their way in. The largest number of bat recorded in one box was 65 Common Long Eared Bat. One bat had been caught and recorded 18 times! People had to have a special licence from the Nature Conservancy to handle the bats. They are weighed, measured and numbered with a little tag. The project has been on going for over 20 years in which time quite a record has been built up about their breeding, life span, areas they inhabit and their benefit to the forest. Some of the original volunteers are still involved with the survey. Rex says that one of the problems that occurred when people know that you are involved with deer is that people pick up supposedly orphaned animals and very often during the early days we used to have people knock on the door sometime in May or June. They would be standing there with little Roe fauns. Although we tried to explain to people that they mustn’t pick them up, they still do it because they think they are doing good and saving the life of a young faun. In fact they were causing a lot more problems for Rex as the faun would have to be hand reared, usually by Betty his wife. The little creatures were so small they needed feeding every two hours with baby food. Betty successfully reared three deer. The first one was called Bambi, who used to go out with Rex on the truck and followed him like a dog. He liked to go out for a walk like a dog on a lead. Bambi sometimes ate the flowers and the dog would follow suit. Rex says that they learned a lot from the deer, as it seemed to respond instinctively to the weather conditions. When the deer were about three months old there were usually taken to live in wild life parks. Over the years Rex has won many awards for his work. One of the most important was when on March 21st. 1989 he went to Buckingham Palace with Betty his wife and Jenny his daughter to receive the MBE, in The Queen’s New Years honours list. Rex is modest about these awards. He says that a lot of people help you and you are very lucky to be selected. The experience was an awe-inspiring occasion and one that the whole family enjoyed. Rex’s other awards include the Courtier Trophy for outstanding service to wildlife management by Sparsholt College, Hampshire. 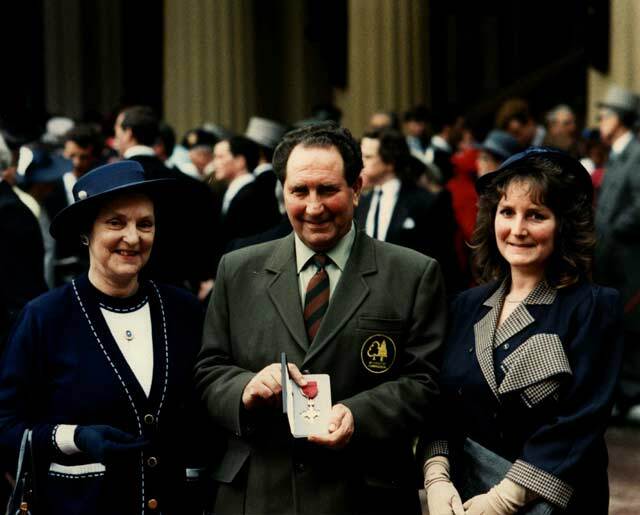 The Balfour-Browne trophy for his outstanding work in managing the forest’s deer herds. Even before the arrival of the railway in both Norfolk and Suffolk in the 1840s, which gave many more people an opportunity to travel much further afield, more speedily and cheaper than before, there has been a long history of East Anglians migrating about the countryside from parish to parish, into the local market towns and much further afield as they sought new employment opportunities. George Cooper who settled in the Suffolk parish of Santon Downham in the 1870s is one of thousands of agricultural labourers who departed from the village of his childhood to seek work and settle elsewhere during the 19th century. 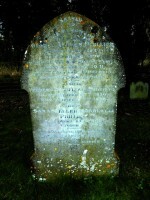 George Cooper was born in the Norfolk parish of Caston in 1832 the 5th of 12 children born to James and Mary Ann Cooper. James was an agricultural labourer who had succeeded in becoming a tenant farmer by the early 1860s. The 1861 Census records the 27 year old George living with his parents at North Acre, Caston. George’s occupation was given as agricultural labourer while two of his brothers were described as machineman and engine man. The portable traction engine was already fast becoming a great labour saving machine on many Norfolk farms and by then traction engines were also gradually making their appearance. Ten years later George, still working as an agricultural labourer which may have involved working steam engines, was living in a small cottage at Wretham, a married man with a baby daughter. His father had died in 1863 and in 1869 George had married Maria Jessup, a domestic servant. The wedding took place at Caston but within a year of the marriage ceremony they had moved on to Wretham where they were recorded in the 1871 Census. The following year another daughter was born. By the early 1870s at nearby Thetford, Charles Burrell’s agricultural manufactory continued to expand as the production of portable steam engines, self-propelled traction engines and threshing machines increased. From the 1850s numerous labourers had drifted into Thetford seeking work in one of the many industries that could be found there. Some were old established processes but others such as the manufacture of steam engines, artificial manure and of course the railway were new ones that required both skilled and unskilled labour. It was the town of Thetford and Charles Burrell’s St Nicholas Works situated in Minstergate that next attracted George Cooper. About 1872 he rented a small cottage at number 20 Minstergate, in the midst of the Burrell ‘works’. George’s experience working with steam engines on farms at Caston and Wretham obviously held him in good stead to gain employment as a labourer/engine driver at the ‘works’. Whilst living in Minstergate amongst the industrial activity, the noise, smells and commotion that surrounded their home,, three more children, Herbert, Rose and George were born to George and Maria. 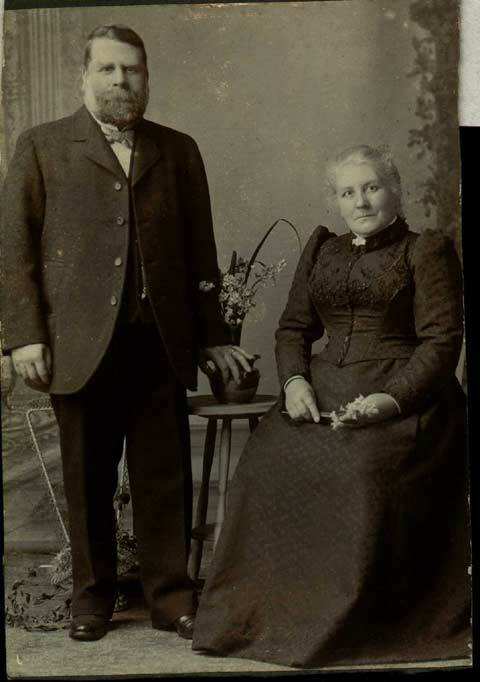 Perhaps it was a lack of living space and the general living conditions in Minstergate that led George and Maria to pack their bags and move from Thetford to the rural isolation of Santon Downham where they settled about 1878. It is easy to imagine George and his family, sitting together on a horse-drawn cart amongst their possessions, as they travelled across the wide expanse of the barren heathland that then dominated the landscape between Thetford and Brandon. Or did they, perhaps, travel by train to Brandon carrying what hand luggage they could, then walking the few miles back to Santon Downham while their large possessions travelled directly from Thetford by cart? George, along with most of the other villagers, was employed on the huge 4,944 acre Downham Hall estate then fairly recently purchased by Edward Mackenzie who was also in possession of the Thetford Manor estate. 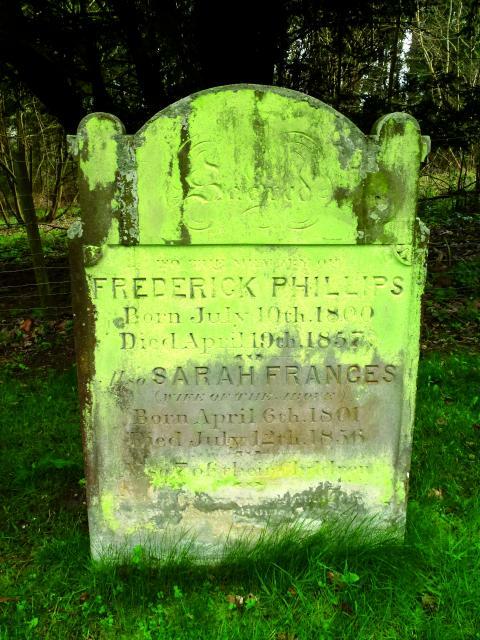 Another explorer of Southern Africa lived here in Santon Downham in the 19th century – George Arthur Phillips, born 170 years ago. In 1841, his father Frederick, was a Land Agent – presumably of the Downham Hall estate. Ten years later the 1851 Census describes him as “Farmer, of 2,500 acres”. 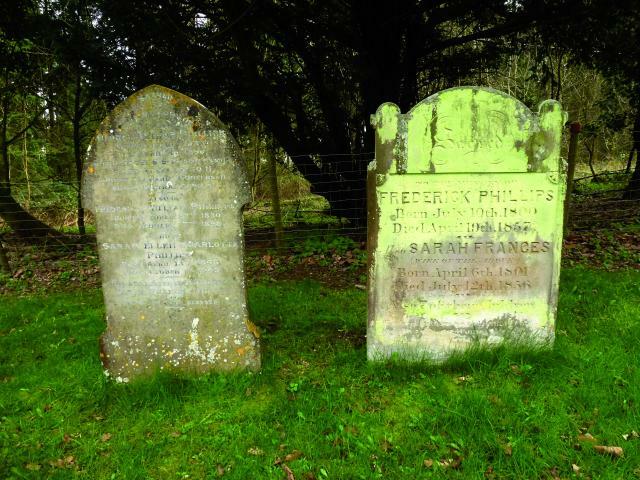 A headstone, at the east end of our churchyard, records the 1860’s burials of Frederick and his wife Frances. 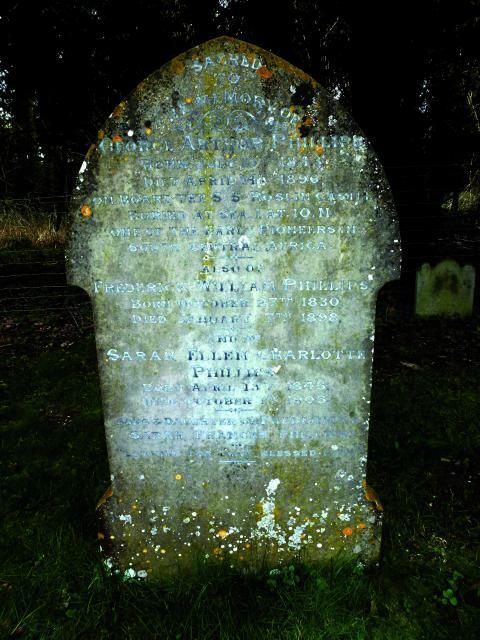 The bottom line reads – “Also 7 of their children”.Next to this headstone is another, which records the burials of three more of the Phillips children. The first part of the inscription reads “In memory of George Arthur Phillips – buried at sea – One of the early pioneers in South Central Africa”. So, what did George Arthur Phillips do? In 1862, at the age of 19, he went to South Central Africa, and explored in Natal. Eventually, he moved to Matabeleland where he met up with a man named George Westbeech. Together, they discovered rich mineral deposits, but then they found that elephant tusks were a better source of income. They shot many of these, and other wildlife animals, for profit. Both men were ‘larger than life’ and well-known to the native peoples. George Phillips had several nicknames. By some, he was known as “Elephant Phillips”, to others – “VOLAIMPI”, which, in English, means –”behold an Army”. Can you hear him coming? He returned to England in 1890, by which time the Phillips family had moved to London. None of the family remained here. Then , in 1896, George boarded the S.S. Roslin Castle to return to Africa, but fell ill and died at sea on 14th April. His body was buried at sea, at Lat 2N, Long 10W (not at Lat ION, as inscribed on the headstone). It was only last autumn that I heard the story of Lieutenant Colonel The Honourable Henry Cadogan. His memorial is in your church, high on the wall, to the right of the Organ. 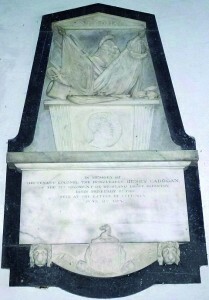 That of an ancestor, Charles Sloane, Earl Cadogan is to the left of the Organ. The story of Henry is very interesting, and worth knowing about – hence, a “scoop” for Santon Downham News! Early in the 19th century, The Honourable Henry Cadogan was a Lieutenant Colonel, commanding the Highland Light Infantry, under General Wellesley (later to become Lord Wellington). The British Army was in Spain fighting Napoleon in the Peninsular War. In 1813, the British Army was successfully pushing the French Army northwards out of Spain. At a place called Vittoria, abut 50 miles from the French frontier, Napoleon’s Army was in a commanding position on high ground, called the “Heights of Puebla”. On the 21st June, the Highland Light Infantry, under Lieutenant Colonel Cadogan, was ordered to mount an assault on the Heights of Puebla, on the right flank of the British line. The Regiment stormed the French position and captured the Hill. Unfortunately, Colonel Cadogan was mortally wounded, but as he watched the successful assault, his last words were “God bless my brave countrymen”. Many historians say that the Battle of Vittoria was “the beginning of the end” of Napoleon’s Empire. He had been forced to withdraw from Moscow in 1812, and in 1815 he was beaten at Waterloo. It is interesting to note that, long before Tchaikovsky wrote the “1812 Overture”, about Napoleon’s retreat from Moscow, Beethoven wrote “The Battle Symphony”, which commemorates the victory over Napoleon by the British at Vittoria. Listen to that music, and you will be celebrating what Henry Cadogan did for us, in Spain, nearly two centuries ago. So why a memorial in Santon Downham? A final point – why should a small wall memorial, in a tiny village, be the marker for a highly successful Army officer? Our memorial is only one of three, to this man. A very large memorial, to him, was erected in St Paul’s Cathedral, and there is yet another in Glasgow Cathedral. But why is there a memorial here? As a boy in the late 18th century, he must have visited his family’s shooting estate in Santon Downham and probably attended St Mary’s Church during his holidays here. Perhaps that is why we have a memorial to him. Next time you visit your church, or St Paul’s, take a look at one of these famous memorials, to Henry Cadogan a gallant soldier.